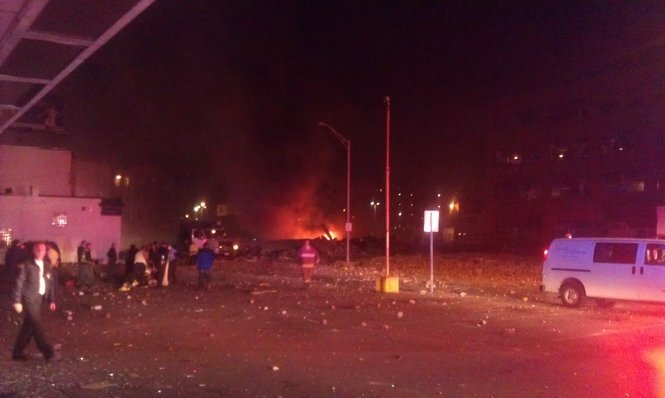 Just tonight, a natural gas explosion not far from us in Springfield has leveled a 4-story building, caused mass damage downtown, and injured over a dozen people. 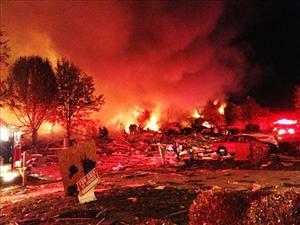 Yesterday, two people were nearly killed by a natural gas explosion in Utah, which did not even make the news. They are reportedly still hospitalized. Updated tonight, a WSJ article shows that almost 30 homes will have to be demolished, 7 were injured, and two killed from what was likely a natural gas explosion in Indianapolis a couple weeks ago. If it is the case, more people were killed from natural gas in that one incident than have been killed in over 50 years of U.S. commercial nuclear power due to radiation (zero). It is also far more people than killed in the Fukushima nuclear "disaster" (also zero- see "Earthquakes and Tsunamis"). 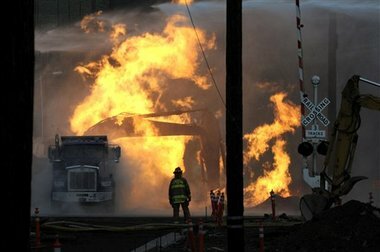 According to a ProPublica study, in just over the past 25 years gas pipeline accidents have killed more than 500 people, injured over 4,000, and cost nearly seven billion dollars in property damages. A couple days ago, Boston University announced the results of a study of natural gas leaks all over the Boston area, which illustrate the potential danger of our aging infrastructure. Not only this, but natural gas is far from emission- or pollution-free energy like nuclear. It still releases at least half the carbon that coal does. Yet, there is no discussion of permanently shutting down all natural gas plants. There aren't major headlines worldwide about the danger, and countries announcing shutdown of their gas industry, like would be seen would there be any far lesser events related to a nuclear plant. What is the reason that we shrug off pollution, deaths, and damage from natual gas but are fearful of even a small and harmless detection of radioactivity? Why have a couple incidents without a single death or documented illness (Three Mile Island and Fukushima) caused major setbacks in our implementation of the only stable, clean energy of the future? The answer is education, and the solution starts with you. The major difference is that the gas industry (which is really the oil and gas industry) knows that it needs to constantly sell its product and buff its image. It buys a whole lot of advertising. That is one of the best ways to ensure that a friendly news media will treat your routine challenges as something to report and then move on instead of as something to dwell on for months during a 24 hour news cycle (as happened during the Fukushima Frenzy). You see, the customers for the news media are not the people who watch the news for free. Those people are the PRODUCT that the news media sells to their real customers - the people who buy the ads and pay the bills that the media conglomerates generate. It is not about education; it is all about marketing, advertising and the power of money as a way to amplify speech. There is a lot of money in the energy business; the people who want to make money by using the best available technology (nuclear) need to recognize they are in a competitive enterprise and start acting like they want to win. Rod, this doesn't seem like a tough concept to tackle... so why hasn't the nuclear industry stepped up their advertising/media campaign? Others have pointed out that a sustained PR campaign by the "nuclear industry" that lines up nuclear against fossil power would be difficult because there is no singular, monolithic "nuclear industry". Most generating companies operate both nuclear and fossil units. They aren't going to bad-mouth one facet of their business to make another, perhaps smaller part, look good. Likewise on the vendor side. A company like GE is just as happy building gas turbine units as they are BWRs. You could mount a positive-only kind of campaign that places nuclear in the context of an "all of the above" approach to energy security, but that dilutes the message somewhat and hitches nuclear to the same wagon as coal, petroleum, and natural gas (at least as far as domestic supplies go), and also wind, solar, biomass, hydro, and any number of other alternatives. Good article, Caroline. Unfortunately I don't have the bucks but if I had, like most nuclear professional organizations do, I'd turn this article into the centerpiece of a YouTube/TV nuclear advocacy PSA, using as its crown the comparative industrial mortality score and index laying it down of just how "dangerous" and "risky" nuclear plants are compared other sources since its inception. It's only a first step and it's a given the fair and accurate media just isn't going to do it -- not even a "neutral" PBS or NPR, so it behooves the nuclear lobby/industry and professional orgs to take the nuclear evangelizing on the road themselves. To see news features as you've posted here going untouched as ammo for nuclear acceptance and education while anti-nukers and media happily leap on a bucket of mildly irradiated water being spilled at a nuclear plant is galling to me, and I wonder just what the PR honchos at nuclear related offices are doing on their hands all these years. The worst disaster involving the gas industry was the San Juanico holocaust in November 1984, which destroyed a Liquified Petroleum Gas (LPG) plant near Mexico City. The entire town of San Juan Ixhuatepec was effectively burned off the face of the Earth. 500-600 people were killed, some burned to ashes, and 5000-7000 severely injured. I would wager almost any amount that no one you'd talk to on the street has heard of this, yet everyone knows Fukushima, Three Mile Island (both zero fatality events), and Chernobil (small number of fatalities).